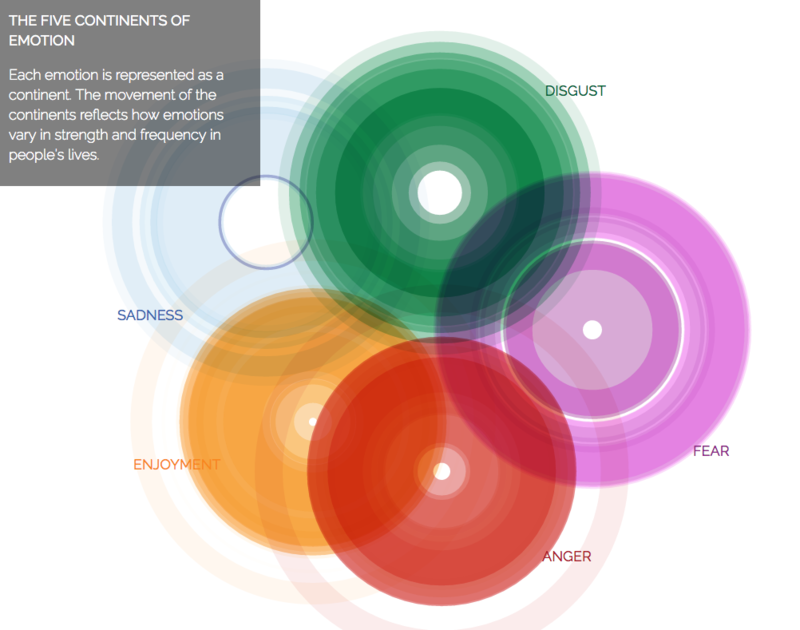 You might have a look at this curious website pointed to by Kevin Randall, an atlas of emotions developed by Paul Ekman and collaborators commissioned by the Dalai Lama (who paid ~$750,000 for the project). After surveying 248 of the most active emotion researchers in the world, Ekman chose to divide emotions into five broad categories (anger, fear, disgust, sadness and enjoyment), each having an elaborate subset of emotional states, triggers, actions and moods. A cartography and data visualization firm was engaged to help depict them in a visual, and hopefully useful, way. I'm really at a bit of a loss to figure out how the byzantine complexity of the beautiful graphic displays are supposed to be useful. They don't quite do it for me. Maybe this is supposed to be a lookup guide for an emotion one is feeling but not quite categorizing? Sort of a bestiary of emotions? A well-intentioned effort, surely, but many of the descriptions seem quite banal and obvious.